AOR is a nonprofit trade association that has advanced recycling and waste prevention in Oregon through its diverse membership since 1977. When businesses, governments, nonprofits, and individuals join together with a common goal, solutions emerge. From supporting important recycling policies and programs at the local and state levels to providing a network where recyclers can share knowledge and expertise, AOR continues to be a solid foundation for recycling and recyclers in Oregon. Join AOR in January and Double Your Impact! Every dollar in new memberships earned by AOR in January will be matched by an anonymous donor, up to $1,000! Get the latest news about AOR, our events, and our members. Sign up for special announcements and our monthly e-newsletter. 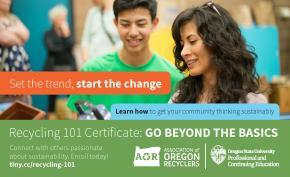 Looking for information on recycling in Oregon? Our Education page includes tools for educators, details about Master Recycler Programs, tips on how to properly handle special wastes, and more.